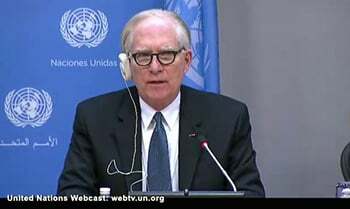 The chair of a UN Human Rights Council investigation into Israel’s use of force against protesters in Gaza has stepped down less than a month after being appointed. Former Pentagon official David Crane resigned from the inquiry for “personal reasons”, according to a statement by the Office of the UN High Commissioner for Human Rights issued on Wednesday. Crane, a former prosecutor at the International Criminal Court, was the chair of a three-member commission appointed in July, a month after member states voted for an investigation into Israel’s use of force. After Israel’s 2006 war with Lebanon, Crane said the country had a right to defend itself but “tends toward disproportional responses”. Israel denounced the launch of the probe by the Human Rights Council, which it has repeatedly accused of disproportionately focusing on alleged abuses by Israel. But the Times of Israel noted after Crane’s appointment that there had been a surprising lack of reaction from Israel, suggesting officials may have been happier with Crane than previous appointments to similar positions. The committee is due to meet officially in early September and provide an oral update to the Human Rights Council later in the month. At least 170 Palestinians have been killed during weekly protests in Gaza since March, with most of them shot dead by Israeli snipers. An Israeli court ordered an investigation into two of those deaths, including the case of a teenager who, according to footage published on social media, appeared to be shot in the back as he was running in the opposite direction to Israeli forces. Crane served as a US government official for 30 years before serving as chief prosecutor in the International Criminal Court’s proceedings for war crimes committed during the civil war in Sierra Leone.